A medical device that can isolate stem cells to mend fractures and a gold medal winning sled are two cutting-edge inventions by scientists at the University of Southampton which have been recognised with prestigious national prizes at the Engineer Technology and Innovation Awards. The 'orthopaedic stem cell concentrator’, which improves the success of surgery for hard to heal fractures, won both the top Grand Prix and the Medical Technology awards. The device, developed by scientists at the University’s Faculty of Medicine and Smith & Nephew, in collaboration with clinicians at Southampton University Hospital NHS Trust, produces concentrated stem cells from a bone marrow sample taken during surgery, which are then reintroduced to the fracture to aid the healing process. Richard Oreffo, professor of musculoskeletal science, who led the project, comments: “We are delighted to have won this award. This invention was developed by a truly collaborative partnership between stem cell biologists, clinicians and engineers. It could transform orthopaedic practise once successfully applied in hospital operating theatres, helping patients recover from severe fractures more effectively." The University of Southampton, along with British Skeleton Association, UK Sport, Sheffield Hallam University and BAE Systems, was also named winner of the Sports Technology category for Project Blackroc, which helped Amy Williams win the Gold medal at this year’s winter Olympics. 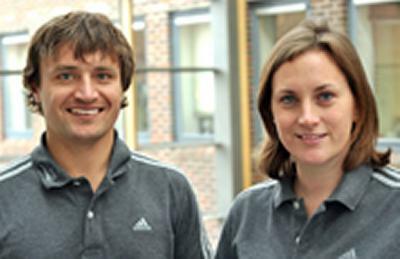 Project Blackroc was led by two University of Southampton Engineering Doctorate (EngD) students, Rachel Blackburn and James Roche, supported by UK Sport as part of its research and innovation team’s work with British Skeleton, who co designed Amy’s sled, affectionately known as ‘Arthur’. The four-year project, involving colleagues from the University’s School of Engineering Sciences and the Performance Sports Engineering Lab, combined experimental work, the latest computational analysis techniques, and included comprehensive aerodynamics testing in the University’s RJ Mitchell wind tunnel.